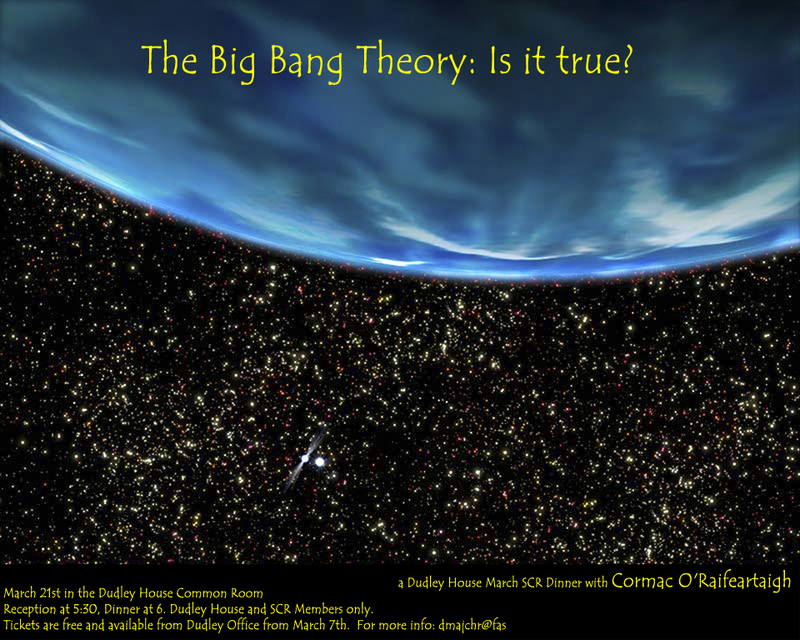 The big bang: is it true? 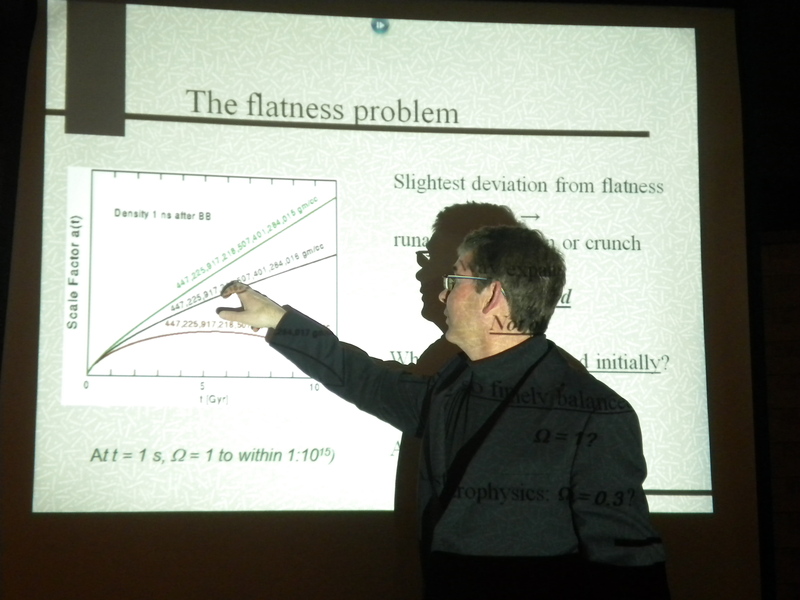 On Monday evening, I gave a big bang talk to the Harvard Graduate School of Arts and Sciences. I really like the way there is a single graduate school for both arts and science at Harvard, what a great interdisciplinary mix. 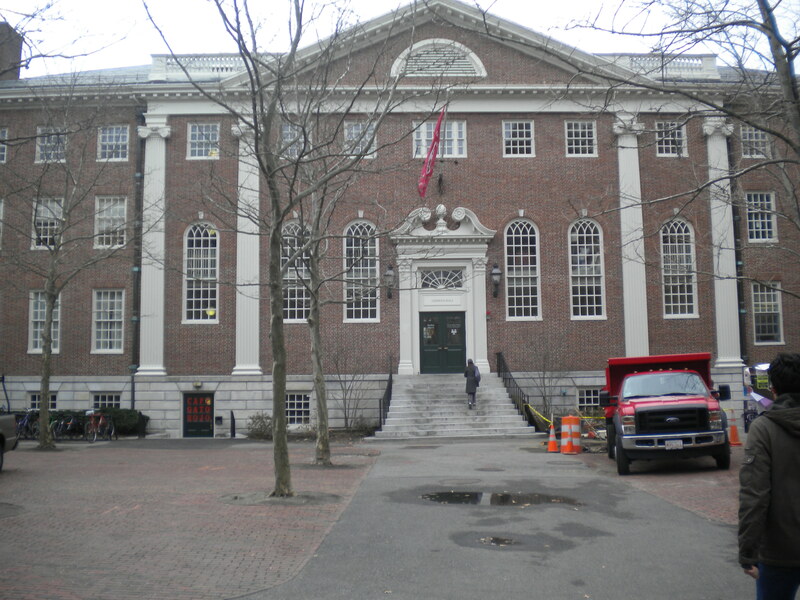 The school has its own activity center, Dudley House ; the house is non-residential but modeled on the residential houses at Harvard, with its own building (Lehman Hall) complete with coffee shop, canteen, senior common room, games room, and a beautiful and quiet library with a fantastic view of Harvard Square. It is served by two faculty masters, an administrative staff and graduate student fellows who organize activities for the School’s 4,000 Masters and PhD candidates. In truth, I spend a good deal of time at Dudley House – perhaps it’s the wide variety of disciplines that makes for such interesting conversations. 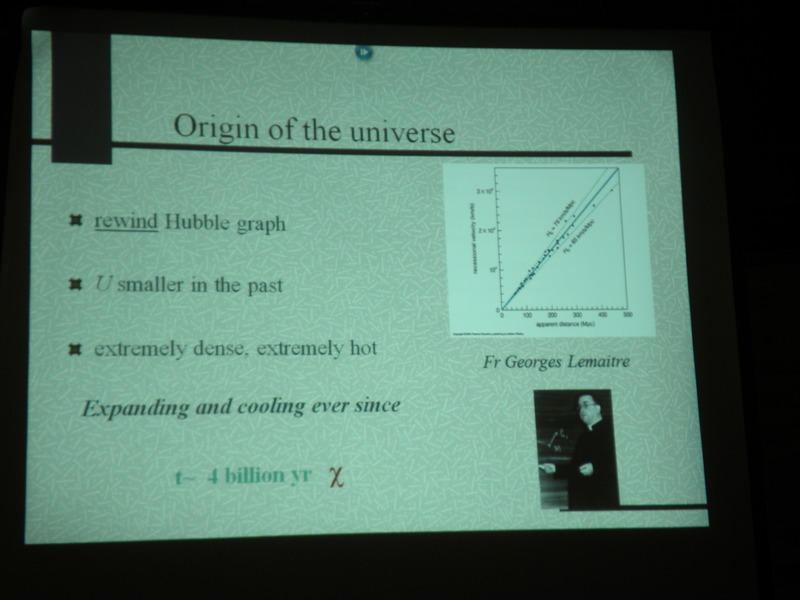 The talk was titled The Big Bang; Is It True? 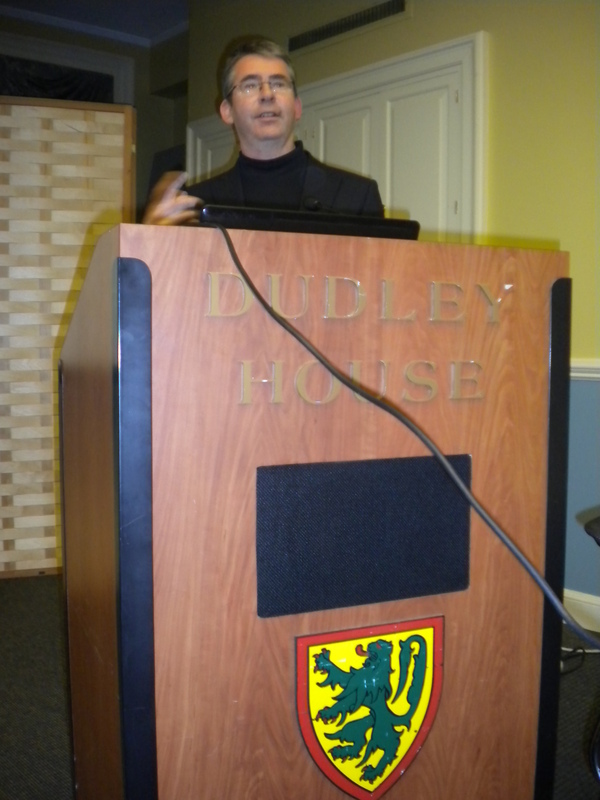 and it was great fun, with a drinks reception, a really nice dinner, a 40-min spiel from me and then almost an hour of questions from the audience. There were postgrads there from history, literature, psychology, philosophy, astronomy and other fields. Apparently, tickets sold out within hours of the posters going up, it shows the interest in the subject. Of course, no scientist can give a definitive answer to the question I posed. 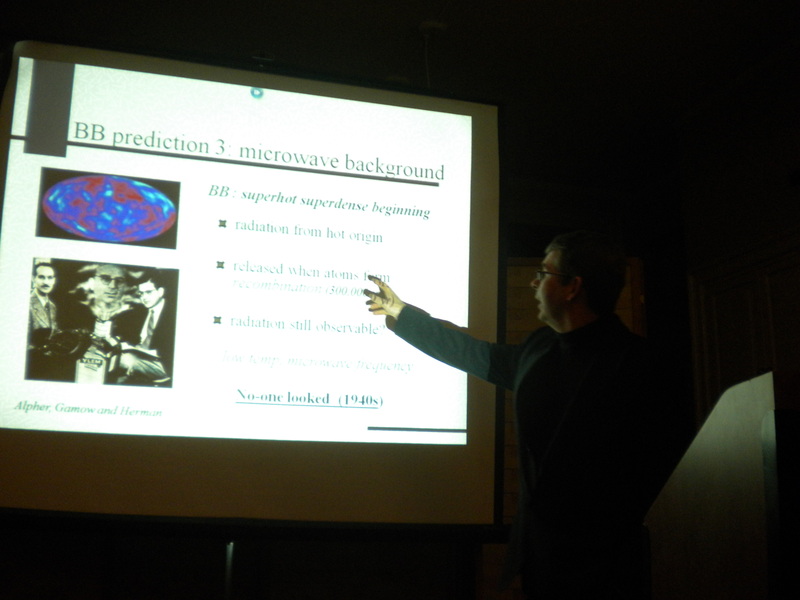 Instead, I laid out a brief history of the discovery of the evidence supporting the big bang model (the expanding universe, the composition of the elements and the cosmic microwave background), followed by an outline of recent puzzles that have arisen from modern studies of the microwave background. I like a quasi-chronological approach to such talks, I think it makes the discoveries and concepts easier to understand, and at the same time it gives the audience a great feel for the surprises nature has in store for scientists. As for truth, the audience can decide for themselves. I really enjoyed the questions and discussion afterward; not for the first time, it struck me that you get very interesting questions and comments from a wide interdisciplinary audience (it doesn’t hurt if they are Harvard PhD candidates). There was also plenty of time to touch on one of my favourite themes; that a great many scientific discoveries come as a complete surprise to the discoverers. Far from being ‘constructed’ in order to support pet theories, scientific findings are often undesirable, unexpected data that no-one knows what to make of at first – an aspect of science that proponents of the social construction of scientific knowledge often fail to address, in my view. All in all, it was great to interact with postgrads from so many different disciplines, I wish I could do this more often. One of the most challenging questions came from Prof Sam Schweber, a well-known Harvard physicist and historian of science. Sam couldn’t make the talk, but he emailed me his question: What happened before the bang? 1. The standard answer is that the big bang model is situated within the context of general relativity, the modern theory of gravity. Since relativity predicts that space and time form part of the universe (and are affected by motion and by mass for example), we expect that time is born at the bang along with everything else – there is no ‘before’ just as there is no north of the north pole. 2. However, cosmologists are less cocksure of this answer nowadays. This is because fundamental problems in describing the moment of the bang (the singularity) have, far from going away, got worse. The problem is due to the inapplicability of the modern theory of gravity to phenomena on the atomic or quantum scale i.e. 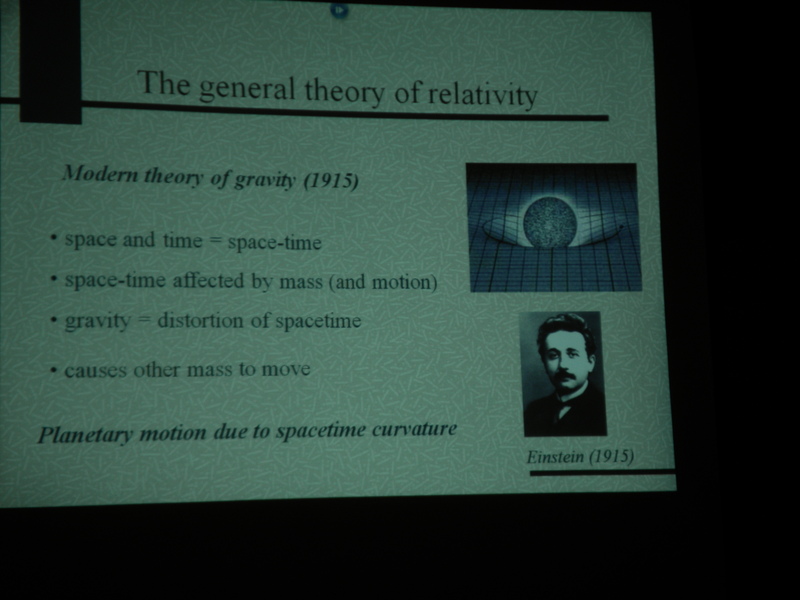 due to the absence of a successful theory of quantum gravity. Since we have no real way of modeling the singularity, we cannot rule out the prospect of exotic phenomena such as multiple bangs. The problem is compounded by the fact that, while recent observational evidence offers support for some type of cosmic inflation close to the birth of the universe, there is (so far) no way of selecting a particular model of inflation – which leaves the door open for models such as the cyclic universe. In other words, we cannot rule out the possibility of a ‘before’ until we have a clearer picture of what happened at the bang itself. Maybe its just me, but i always need “proof”. Science needs 100% verifiable proof if any single part of science is to succeed. Proof if the cornerstone of science. Its just my personal opinion but red-shifted EM energy is NOT proof of a big bang. Also, the CMB is NOT proof of a big bang either; Its just another picture of the sky in a different wavelength. But i said this to you at a similar public lecture in WIT about 2 years ago and you payed no attention then either. I bet you 1 USD that i’m right! Only time will tell if i’m correct, but i don’t think we will have to wait much longer. I am sending you a New Paradigm in Physics-Cosmology by Dr. R. L. Carezani that show why Einstein is absolutely wrong and with mountains of PROOFS. Please could you make a comment on this New Paradigm? I’m afraid not John – the problem is we never know what new observation will destroy our pet theory. What science can do is suggest hypotheses, and rule some out as a process of elimination. One thing that always bothered me about the first moments of the big bang. Due to the incredible density at that moment and the rapid expansion is our estimate of the size and age of the universe wrong due to the effects of time dilation. Would this lead to the idea that the universe is far older than the current 13.7 billion years old? I regret to tell you this but Time Dilation is an Einstein Fantasy added to all other from him. It is a experiment at Cal-tech that prove that time Dilation doesn’t exist. Yes, the good old GPS satellites in space. Even NASA and the US military say that time itself is different up there so they have to correct for the time discrepancy to keep the clock in sync. Dr. O’Raifeartaigh, NASA would never be wrong! Would they???? And the GPS constellation are tracked by the US military. But the US Military would never be wrong either! Would they??? And our old friend Einstein, well now!!…. look there is no way Einstein could have been wrong! Einstein was a genius! Einstein was….. Well….. Einstein is comparable to …God!. Einstein could never be wrong! Could he? Remember what i told you Dr. O’Raifeartaigh some time ago. I told you the answer would come from “The old Irish sod”. If your clever, you will learn to read between the lines in the things i say. Einstein, like all scientists, could be and was wrong. General Relativity is accepted not because it was proposed by Einstein, but because it has passed all experimental tests so far. [quote]General Relativity is accepted not because it was proposed by Einstein, but because it has passed all experimental tests so far. Are you really sure about that Colin? Are you 100% sure its passed all the tests? Did you check any of the tests yourself? I did, and it failed. Hubblesite told us that the dark masses where 3000.000.000.000 years old and that they the dark masses only let go the antimatter, what I suppose is that the antimatter hence accumulated, reaching the critical point, contracted,hence contraction of time, then the explosion, transforming the antimatter into matter(anti antimatter) the BB, this explains, why there is no antimatter in our universe today! Hi Micheal, great question. I should point out first that inflation is not a done deal – it is regarded as being compatible with observation, but far from definitively established (especially which model). Because it is expected to have occurred over an extremely short timeframe, I don’t think there are major implications for the age of the universe (once the expansion is taken into account). But you’re on the right track – where time dilation creates an enormous headache is close to the bang itself. What does time even mean under such conditions of density? This is a major problem in quantum gravity. Hi John, Colin:I would go even further than Colin and point out that, not only does our understanding of GR spring from exhaustive experimental tests, it happens that the views of Einstein on the cosmos carry very little weight amongst cosmologists. 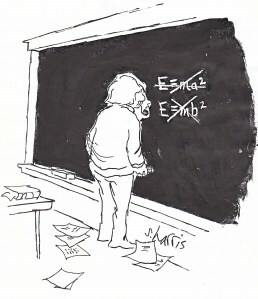 It’s not just that E. missed the prediction of the expanding universe arising naturally from his own theory – he strongly opposed it twice, and only very grudgingly gave way when the evidence became overwhelming. So to accuse cosmologists and astronomers of kowtowing to Einstein rather than the evidence is quite ironic! It also overlooks the hardheaded, bitter scepticism inherent in the methodology of experimental physicists, but John is not alone here..
You have blogged a lot in the last few years about the “scientific method”. You have a good understanding of how it works. So if we cut to the crunch, isn’t the “scientific method” better described as “skepticism”. Without skepticism, we would all just be sheep following whatever Shepard shouts out his opinion on how things work the loudest. Its skepticism that drives science. Its skepticism that purifies science and its skeptics like me that stand one step ahead of science challenging its concepts. Right now, today, the biggest single stumbling block to science progressing forward is peer review of science literature in scientific journals. Peer review has blocked science skeptics like me from publishing my scientific findings. But mark my words, the world is about to change and peer review of scientific journals won’t get in its way. Science has a very bright future ahead. The answer lies in the “old Irish sod”. Call me Cormac – I hate titles. Re peer review, it can be very conservative (rather this than the other way round). Have you tried ArXiv? Will you endorse me so i can publish on Arxiv? I need someone to endorse me. You have me email address from these comments. You can’t publish science papers on arxiv unless someone endorse’s you first. Dr. O’Raifeartaigh will you collaborate with another Irish scientist on a physics paper i’m writing? F. J. Tipler, “The structure of the world from pure numbers”, Reports on Progress in Physics, Vol. 68, No. 4 (April 2005), pp. 897-964. http://math.tulane.edu/~tipler/theoryofeverything.pdf Also released as “Feynman-Weinberg Quantum Gravity and the Extended Standard Model as a Theory of Everything”, arXiv:0704.3276, April 24, 2007. Reports on Progress in Physics is the leading journal of the Institute of Physics, Britain’s main professional body for physicists. Further, Reports on Progress in Physics has a higher impact factor (according to Journal Citation Reports) than Physical Review Letters, which is the most prestigious American physics journal (one, incidently, which Prof. Tipler has been published in more than once). Tipler is Professor of Physics and Mathematics (joint appointment) at Tulane University. His Ph.D. is in the field of global general relativity (the same rarefied field that Profs. Roger Penrose and Stephen Hawking developed), and he is also an expert in quantum field theory and computation theory. His Omega Point cosmology has been peer-reviewed and published in a number of prestigious physics and science journals in addition to Reports on Progress in Physics, such as Monthly Notices of the Royal Astronomical Society (one of the world’s leading astrophysics journals), Physics Letters, the International Journal of Theoretical Physics, etc. In the second post above, I provide links to all of Prof. Tipler’s peer-reviewed papers on the Omega Point cosmology that are available online for free. This does indeed make for good reading. Forsooth, it’s the best reading, if what one is looking for is the answer to life, the universe, and everything–i.e., on physical grounds. A simple understanding of electrical engineering and plasma physics completely eradicate the big bang. it’s still the same, the standard model is banged into our heads, untill it becomes the one and only truth! Hubblesite explained that they had observed the dark masses to be 3 trillions of our years old and that they only le go of antimatter so my conclusion is that the antimatter was sort of collected(hence the rejection from dark matter) when the mass of antimatter got to the critical mass it collapsed causing a retraction of time 1 second to jump to an explosion the BB 2 sec after the implosion(explains why it looked like the beginning of time) and furthermore explains why there is no antimatter in our universe. We have to look at the universe as un evolution where events are created which creates new events and we can only use => sign no =, because the events are with no return! The Big Bang is a simple TALE for Children by Lamaitre in the pass Century and the Astronomical observation contradit the Tale with many peoof. The Universe neither has not beginning nor End. Only is in perpetual evolution.